ELLIS – Recently, Phillipsburg coach J.B. Covington had malignant melanoma return on his face, 18 months after he first had a spot removed. Covington traveled to Hays to see renowned skin doctor Don Tillman, who then sent the coach to Kansas City for further examination. “I didn’t think too much about it, but my wife is a RN, and she freaked out, so she got me in to see Dr. Tillman,” Covington said. On Monday, Covington had surgery and has a gash that runs from underneath his eye down to his jaw. Covington returned to practice Wednesday. Even with his absence, Phillipsburg, buoyed by its new-look offensive line and experienced skill players, rolled over Ellis, 56-14, on the road in Mid-Continent League action Friday night. Covington wore a bandage over his right cheek through the evening. “Got me fixed up hopefully. I look like Scarface for sure,” he said with a laugh. Phillipsburg, ranked No. 4 in Class 3A, improved to 5-0 with the first meeting versus the Railroaders since 2011. The Panthers, defending 2-1A state champions, have won 12 straight contests. In the first half, Phillipsburg ran 23 snaps for 390 yards and six touchdowns. The Panthers led 15-7 after the first quarter and 43-14 at halftime. At one point, the Panthers scored on four of five offensive plays, including three straight. Injury-plagued Ellis dropped to 3-2. 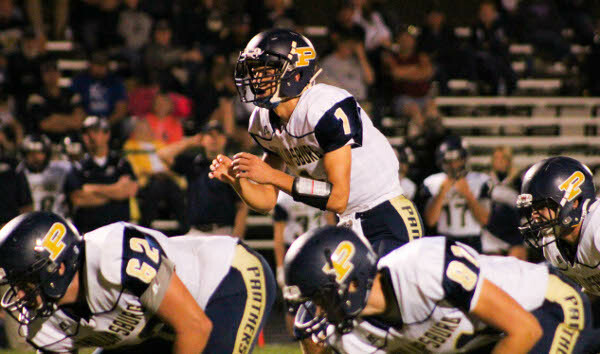 Phillipsburg’s well-known backfield of Kirk and Mark Coomes and sophomore quarterback Trey Sides all delivered big games. Kirk, a junior, had nine rushes for 157 yards and TDs of 30 and 50 yards. Mark, a senior, finished with six carries for 105 yards and scores from 32 and 25 yards. Sides had an 86-yard scoring run and a 65-yard TD pass. Junior fullback John Gower finished with seven carries for 64 yards, including a 31-yard scoring run. Defensively, Gower had another big game at linebacker with 2.5 tackles for loss. Junior Jordan Ford returned a fumble for a score. Ellis senior Easton Smith finished 5 of 13 for 92 yards with a score. Smith broke the MCL record for career passing yards last week. This week, Smith bumped his career completions to 186 to break the mark of 184 set by Dusty Trail, the former Osborne signal caller and current Bishop Carroll offensive coordinator. “I couldn’t be more proud of Easton on some of those accomplishments, but also I am even more proud of the fact that we are running the ball, and he is into that just as much,” Ellis coach Craig Amrein said. Ellis is without senior running back Clay Feik (knee) who is expected to return sometime this season. As well, starting end Ryan Herl (chest) and junior Joseph Eck both exited the game. The speedy Eck was shaken up on a big hit near the sideline. He finished with 18 carries for 77 yards with a 20-yard TD run and a 58-yard scoring reception. Last season, the Panthers opened 4-1 with a 191-69 margin en route to its first state title. This year, versus a similar slate that includes wins against ranked teams Smith Center and Plainville, the Panthers have outscored teams 201-52. Up front, Phillipsburg graduated 300-pounder Donovan Lumpkin (first team all-league), 240-pounder Conner Boxler (second team) and 270-pounder Kian Stegmaier (honorable mention). Additionally, standout fullback Brock Means graduated, along with defensive lineman Jace Gordon and linebacker Conner Weinman, a trio who also collected all-MCL at some level. The line, under veteran assistant coach Joe Buresh, has retooled with sophomores Jaret Shelton (5-7, 220) at center and Kasen Keeten (5-7, 165) at left guard. Junior Chris VanKooten starts at left tackle at 6-foot, 190 pounds. As well, junior Colby Wells (5-9, 155) has rotated into the line. The other two right side positions feature Seth Jacobs (6-2, 234) at tackle, and junior Drew Stapel (5-10, 190) at guard. Jacobs was first team all-league offense, Stapel first team defense in ’15. Ellis briefly closed the game to 8-7 in the first quarter before the Panthers’ flurry of big plays and scores yielded 28 unanswered points. Mark Coomes’ two TDs in the second quarter came off huge holes.